Archbishop Carroll # 20 Hope Syron hugs # 25 Bridget Hislop as # 22 Erin Sweeney looks on after Archbishop Carroll lost the Archbishop Carroll vs. Chartiers Valley H.S. PIAA Class 5A girls basketball state championship game at the Giant Center in Hershey, Pa. on March 23, 2019. 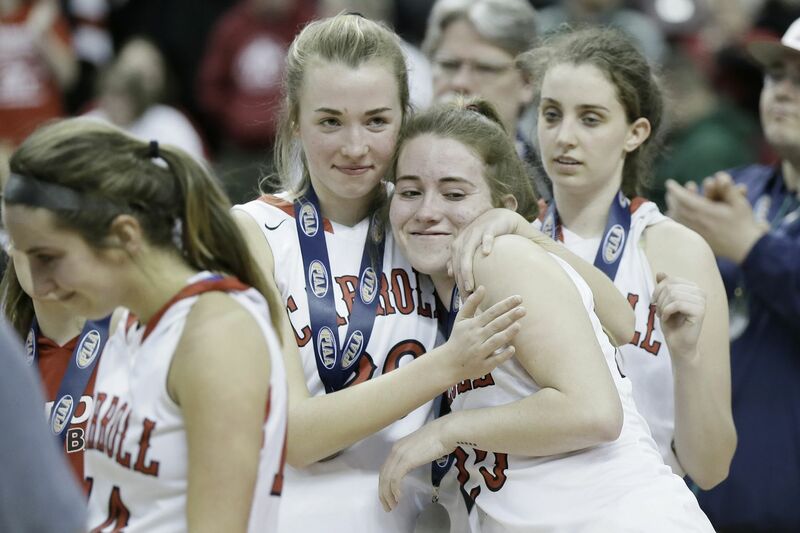 HERSHEY, Pa. -- Senior guards Mary DeSimone and Harlem Jennings shared hugs on the court with their teammates as Archbishop Carroll was receiving its runner-up medals. They gave their all to the program during their high school careers, which came to end Saturday night at Hershey’s Giant Center with a 53-40 loss to Chartiers Valley in the PIAA Class 5A final. DeSimone only had one shot in the game, but it was never her scoring that made her effective in her four years at Carroll. She finished the game with five rebounds, a block, and a steal. Carroll trailed most of the first half, and only tied the game once, at 12, on freshman guard Grace O’Neill’s three-pointer. Archbishop Carroll # 22 Erin Sweeney looks to pass the ball around Chartiers Valley # 4 Megan McConnell in the first half of the Archbishop Carroll vs. Chartiers Valley H.S. PIAA Class 5A girls basketball state championship game at the Giant Center in Hershey, Pa. on March 23, 2019. The Patriots trailed, 23-20, at the half, and were outscored 19-9 in the third quarter. Most of that had to do with Chartiers Valley’s size and length. The Colts held the Patriots to 13-of-45 (28.9 percent) shooting from the field, including 5-for-20 for three-point range. Mackenzie Wagner, a 5-foot-11 junior guard, led the Colts with 24 points and 6-2 senior center Gabi Legister added 13 points. Chartiers Valley attempted only nine threes while shooting 18-for-32 (56.3 percent) from the field. Erin Sweeney paced the Patriots with 19 points. Shields is looking forward to having Sweeney back after a breakout junior season. Chartiers Valley’s coach, Tim McConnell, the father of 76ers point guard T.J. McConnell, guided his team to a 30-0 record, and got to coach his daughter Megan, a junior guard. Megan did something her two brothers never did. AC: Karli Dougherty 6, Harlem Jennings 6, Nikki Mostardi, Grace O’Neill 6, Erin Sweeney 19, Hope Syron 3. CV: Megan McConnell 5, Mackenzie Wagner 24, Alexandra Ferrell 3, Aislin Malcolm 6, Gabi Register 13. Archbishop Carroll # 44 Harlem Jennings and # 21 Karli Dougherty battle Chartiers Valley # 55 Gabi Legister and # 4 Megan McConnell for a loose ball in the first half of the Archbishop Carroll vs. Chartiers Valley H.S. PIAA Class 5A girls basketball state championship game at the Giant Center in Hershey, Pa. on March 23, 2019.